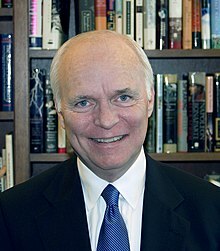 Brian Patrick Lamb (; born October 9, 1941) is an American journalist and the founder, executive chairman, and now retired CEO of C-SPAN; an American cable network which provides coverage of the U.S. House of Representatives and U.S. Senate as well as other public affairs events. Prior to launching C-SPAN in 1979, Lamb held various communications roles including White House telecommunications policy staffer and Washington bureau chief for Cablevision magazine. He also served as a commissioned officer in the United States Navy for four years. If you get too excited about any one interview, you're making a mistake, because people do cancel. I've been invited to appear on Letterman, but they wanted me to talk about a funny videotape of Congress. 'Bring us your outtakes!' That's not our job. I'm anti-big power. I don't know if that's populist or not. You can't guarantee everything's going to be televised. I think technology has changed America, not any one organization. Technology is taking the power away from the few. There'll be a lot more choices, and good people who are doing serious stuff will survive and there'll be a lot more voices, and that is very healthy. More than anything else, we need in this society the opportunity for people to tell us what they think without being told that they're either dumb, or stupid, or uninformed. I think, in some ways, I like it when people tell me what they're thinking. I would rather have it that way than masquerade as if you're totally unbiased and objective. Some people when they get older are so firm in their beliefs that you'll never move them. I don't like swearing on the air. As a matter of fact, I'm not a prude, but... I watch HBO and some of the comedy stuff, and I'm constantly asking myself, 'Why have we gone there?' It seems like it's unfortunate. It's so cheap. It's so easy. The Purdue education was fine, but I wasn't ready to learn when I was at Purdue. It's very nice to be able to write something you don't have to get four other people to agree with before it can become authoritative. I vote in every general election, but I'm not a party member or an ideologue. I've never told anyone who I've voted for. It's easier to fix damage than it is to create it. We have more voices from more points of view on the C-SPAN call-in show than I've heard anywhere else. You can literally tune us in every day and hear it all. You can't control it, and you shouldn't control it. I've never been a member of a political party, but people will superimpose on you what they want.